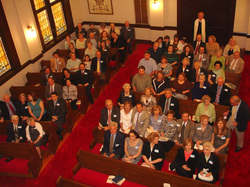 In May 2008, Congregation Beth Israel of Gadsden, Alabama, gathered together in their synagogue on Chestnut Street to celebrate the 100th anniversary of their first communal religious services in 1908. Adolph Solomon, its oldest congregant at ninety-two years old, welcomed all of the past and current members of the congregation. Many traveled long distances to return to this former industrial hub in northern Alabama to celebrate and remember. While Solomon looked out at the sanctuary, he must have been amazed by how the seats were completely full; the sanctuary had not been this occupied in years. With over 120 people among them, they began a night of thinking about the past. There was Hugo Hecht’s commanding grip over Sunday school, picnics at Crystal Springs with Rae Glass’s exceptional deviled eggs, Janice Lowi faithfully playing the organ, and the story of a young rabbi from New York who went squirrel hunting for the first time. There was the annual Sisterhood-sponsored rummage sale that the whole town looked forward to all year. Their chronicle is one rich in memorable stories, vibrant characters, and one violent altercation. Though originally founded in the 1830s, Gadsden was nothing more than a small farming village until after the Civil War. A handful of visionaries saw its convenient location astride the Coosa River and the abundance of iron, manganese, coal, and limestone mineral deposits as a perfect site for industrial steel production. With the formation of an electric plant in 1887, and a hydroelectric plant in 1902, Gadsden’s economy grew rapidly. So when the riverboats navigating the Coosa began to make frequent stops at the Gadsden port, they not only dropped off a new population of industrial workers, they delivered a group of Jewish peddlers and their families looking for a good place to set up shop. These early settlers laid the groundwork for the community that would gather to reminisce more than a hundred years later. Jews lived in Gadsden as early as 1900. Among these first Jewish citizens were Jacob and Bertha Nadler, Hugo Hecht, David Reich, and Albert Hagedorn. By 1903, the entirety of the Gadsden Jewish population, now roughly ten families, decided to meet communally on Sunday mornings in order to provide a Jewish education to their growing number of children. With no place of their own, they met in the Nadlers’ living room. In 1908, the new community gathered together in a rented room in the Gadsden National Bank building to have their first High Holiday services lead by Hugo Hecht and Jacob Nadler. Even though they were new to the community, the Jews of Gadsden quickly gained prominent roles in the town as leading merchants. Newspapers from that period were littered with advertisements for Saks Department Store, Frank & Hagedorn Men’s Ware, and Herzberg-Loveman & Co. showcasing the latest in ladies’ headwear. Among these early retailers, was the Zemurray family, whose brothers Isadore and Sam ran a small fruit shop. Sam “the Banana Man” Zemmuray later moved to New Orleans and become the CEO of the infamous United Fruit Company, where he often dabbled in international affairs and Latin American politics. 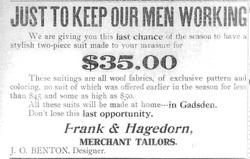 As their shops grew, these men gained ties with non-Jewish members of the larger Gadsden community. Gadsden business leaders played a famous weekly poker game. By all accounts, the Jewish men shared part of their winnings from these games to pay for the eventual construction of a synagogue. The Jewish women of Gadsden formed a Sisterhood in 1911, and rather than using high-stakes games of seven card stud or blackjack to raise money, they hosted sandwich sales to raise funds. This was the beginning of a long line of sisterhood fundraisers. 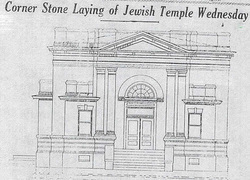 Thanks to poker winnings, Sisterhood fundraising efforts, and personal contributions, the Jews of Gadsden broke ground on their temple on March 8, 1922. Though they had raised the money for a building, Beth Israel had no permanent rabbi during these early years. In the spirit of do-it-yourself religious practice that Beth Israel still follows to this day, Hugo Hecht, a young German immigrant, stepped up as acting lay-religious- leader. Hecht conducted Shabbat services, wrote sermons, taught weekly Sunday school, presided at funerals, as well as serving as temple treasurer and secretary. Though he was a volunteer and complete layman, Hecht took his job seriously. Long-time Beth Israel members still remember his stern grip over Sunday school class and living in fear of a scolding from the very serious Mr. Hecht. After years of his leadership, temple officers decided they should pay him for all his work, and awarded Hecht a $20 a month salary. As the years went on, Beth Israel grew. They joined the Union of American Hebrew Congregations, the representative body of Reform Judaism, by 1920. Through the 1930s they weathered the Great Depression fairly well. Gadsden, as an industrial town, was not as severely impacted as many of its more agriculturally based neighbors. During World War II, Camp Sibert, the local chemical warfare plant, brought a large population of young Jewish service men from all around the country. They flooded Beth Israel; several married local Jewish women and became permanent members of the community. Some took their Gadsden brides back East. One longtime Beth Israel member describes eating lunch at a delicatessen in New York City in the 1960s and discovering that her waiter married his wife at her hometown synagogue in Gadsden. By 1946, Beth Israel had grown to nearly 30 families. In 1944 they hired their first full-time rabbi, Ernst Appel, the scion of a long line of rabbis in Breslau, Germany. Rabbi Appel came to the U.S. in 1936 to escape Nazi violence. Before leaving Germany, he had spent some time in jail for his political beliefs. Upon gaining American citizenship, he joined the Gadsden community and served as Beth Israel’s spiritual leader for two years before taking another pulpit in Maryland. In 1960, the Jewish community in Gadsden numbered 145 people. Walking down Broad Street, Gadsden’s main road, one could clearly see the impact of the Jewish community. The banner of Saks Department Store stretched out for half a block alongside the towering (for Gadsden) Reich Hotel, notable as the premier lodging of Etowah County. 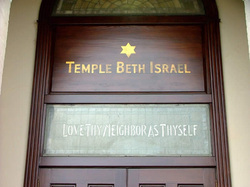 And if you walked by the temple on Chestnut Street Friday night, you might hear the vibrant melody of prayer and song echoing from Beth Israel. The Sisterhood purchased a new organ for the temple’s 25th anniversary, with each member donating money to have their name embroidered on the organ cover. Organist and music director since 1925, Janice Lowi climbed up to the choir loft and played every weekend, happy to be playing on a new, beautiful sounding instrument. March 26, 1960, was going to be a historic day for Congregation Beth Israel because they were to dedicate the new addition to their synagogue. The wing, donated by the Zemurray family, included religious school classrooms and a new kitchen. It was the first major construction they had done on their building since 1922. But when the majority of the 60-family congregation gathered to celebrate the opening of the new wing, they could not have foreseen that this day would be historic for more unfortunate and tragic reasons. What they did not know was that a deeply troubled 16-year-old boy named Jerry Hunt was driving around the neighborhood looking for Beth Israel. 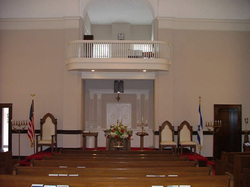 After the sanctuary filled with both adults and children settling into their seats, Rabbi Saul Rubin began the service in dedication to the new addition. In the spirit of the inscription above their door, “Love Thy Neighbor as Thyself,” two prominent pastors, Rev. John Speaks and Dr. Franklin Denson of First Methodist Church had joined Beth Israel for the service. Fifteen minutes in, after Denson had delivered a benediction, those gathered suddenly heard an explosion from outside followed immediately by a window in the rear of the sanctuary shattering to pieces. A Molotov cocktail had pierced the window, though it had failed to ignite. The congregation burst into panic as Rabbi Rubin urged them to stay inside. Alvin Lowi and Alan Cohn rushed out to find who was responsible, only to face Hunt who was armed with a .22 caliber rifle. Total fear set in as the congregation heard shots fired from outside and the sound of Hunt driving away. Rubin tried to get his congregation to remain calm while someone called the police, and suddenly through the din of panic and tears someone began to sing “Bless this House,” and the crowd settled into uneasy stillness as they waited for the police to arrive. Nervously, they finished the remainder of the dedication service. The local law enforcement acted swiftly, setting up roadblocks to catch the perpetrator and sending ambulances for Lowi and Cohn. Lowi had only been shot in the hand, but one of Hunt’s bullets had nicked Cohn’s aorta and he was bleeding profusely. He remained in critical condition for hours. Meanwhile, the police eventually tracked down Hunt and brought him in for questioning. He confessed readily, clearly demonstrating a disturbed nature. Investigators discovered that Hunt had gone to a rally for the anti-Semitic local politician Admiral John Crommelin, and had an altercation with a Jewish boy at the Gadsden Recreation Center over a game of chess earlier that week. Both Alvin Lowi and Alan Cohn survived. Cohn had to receive 22 pints of blood to stay alive, most of it coming from emergency donors all around town. Years later, people in Gadsden still approached him to tell him that he received some of their blood. This immediate community concern extended to the entirety of Congregation Beth Israel. The week following the attack, they met for Shabbat and their sanctuary was filled with people from all over wishing to express their deep shock and concern over the violence. People lined up in the streets outside, and the local radio station broadcast Rabbi Rubin’s sermon for all to hear. That service was the only closure the community could have, because the following weekend, Jerry Hunt, out on bail, recklessly drove his car into a tree and died. No trial or court proceedings ever occurred. Following the incident, Franklin Denson wrote an editorial in the Gadsden Times expressing his remorse and shame, saying: "Our community has been a city which we could be proud… No city in America can boast of a better record. Love had bound us together. [However] This terrible catastrophe which has befallen us does not represent the attitude of our people in this city and country…. Pray God that love will prevail in our land—yes, and in our city." Since the 1960s when their roster had sixty family names, Beth Israel’s congregation has shrunk considerably. In 1993, there were forty-three member families. Gadsden's economy suffered in the 1970s and 1980s, when many of the major factories—Goodyear Tire and Republic Steel among them—shut down. These developments affected the Jewish community as Jewish-owned stores closed and new generations looked to other places to find their livelihood. Though Gadsden did enjoy some economic recovery in the 1990s and engaged in many urban renewal projects, the local Jewish community has yet to recover. In 2000, there were thirty-eight Jewish families. That number continued to decline in the first decade of the twenty-first century. By 2008, Beth Israel’s youngest adult member was forty-eight and they no longer had any children to fill an educational program. Though Rabbi Scott Saulson from Atlanta came once a month to lead services, Beth Israel was for the most part without rabbinic leadership. However, just like in their early history, their tenacious do-it-yourself attitude drove them forward, and they held lay-led services every Shabbat. 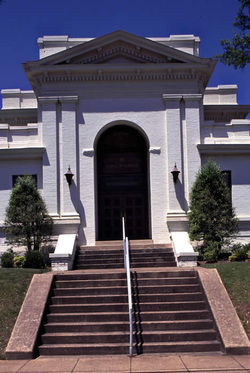 In 2010, Beth Israel decided to close its doors, bringing to a close over a century of organized Jewish religious life in Gadsden.